Few things come close to the thrill and exhilaration of skydiving. Likewise, there are few places more breathtaking and beautiful than Australia. Combining these two things makes for an unforgettable experience for extreme sports fanatics everywhere; because in the outback, “getting high” takes on a whole new meaning. 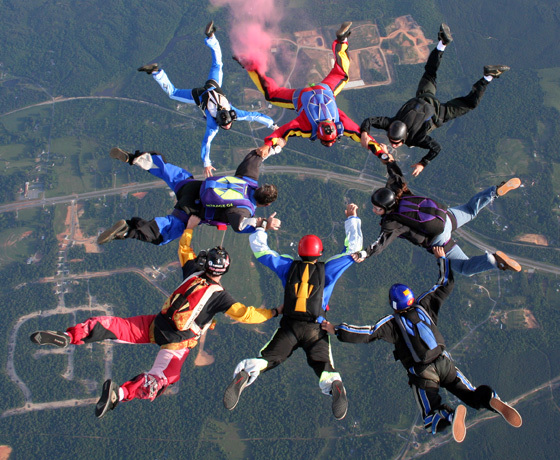 What makes the experience even better is that there is not just one amazing way to go skydiving in Australia. There are so many beautiful places to skydive that you can experience the rush over and over again; and each place has something unique to offer. Here is a list of what we’ve deemed to be the top 10 places to go sky diving in Australia. Queensland is one of the most beautiful places in Australia, and one that has managed to remain so despite the amount of people that come through it. For those who enjoy a day at the beach almost as much as they enjoy extreme sports, this tropical paradise is just what you are looking for. Skydiving at Mission Beach offers you a jump from a heart-stopping 14,000 feet with views of the rainforest, tropical islands, and the Great Barrier Reef spanning over 8 miles. Extreme sports are all about the rush, and the sixty second free fall before your chute opens should provide all the rush you could ever need. 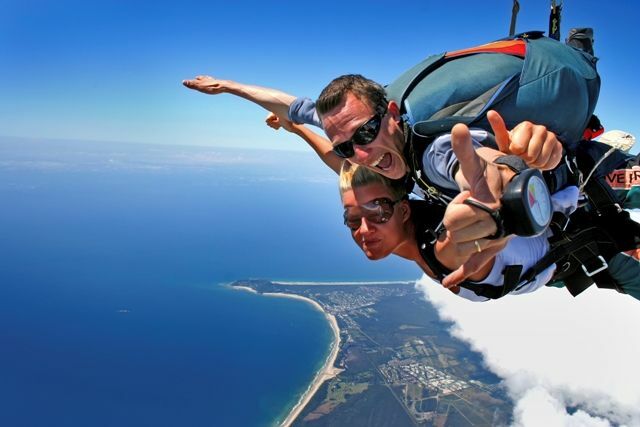 While skydiving in Australia is known to be some of the best by extreme sports fanatic the world over, Coffs Harbour is quickly becoming one of the most popular sites. 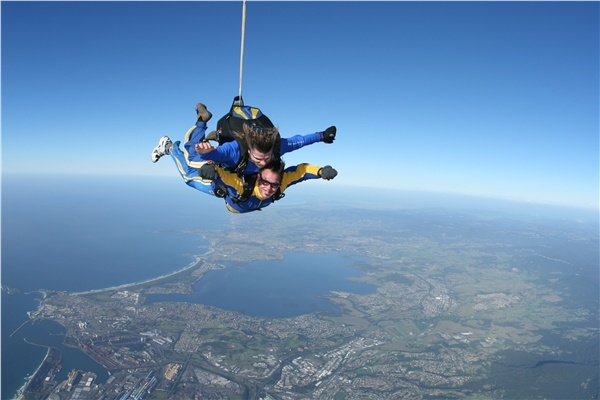 Skydiving over Coffs Harbour offers incredible views of the coast as you enjoy your 8 minute fall (after nearly a full minute of free-falling! ), and wait for your feet to land upon the soft sand of one of the gorgeous beaches. At Coffs Harbour, you get to pick your level of extreme, so even those who still approach extreme sports with an air of caution can get their adrenaline fix for the day (or year). You can choose a jump from 9,000 feet, 11,000 feet, or 14,000 feet. Rest assured that no matter which you choose the experience will be one that you won’t soon forget. 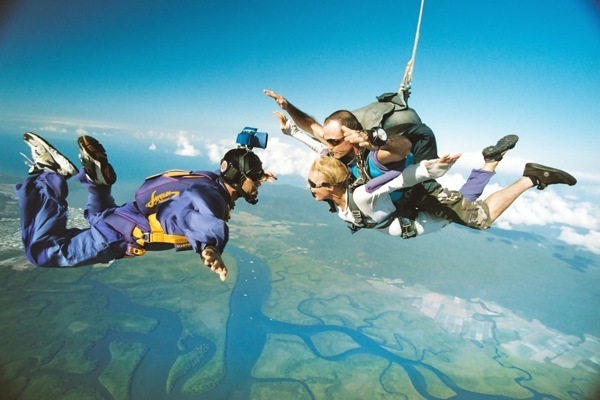 Skydiving in Australia doesn’t get any more breathtaking than in the Whale Watch capital itself; Hervey Bay. This is another jump that allows you to pick your poison; choose whether you want to jump from 9,000 feet up to 14,000 feet. Anyone who’s into skydiving as an extreme sport will tell you that the number of feet you fall is really irrelevant as the adrenaline kicks in, your heart starts pumping, and you see the world from a whole new angle. 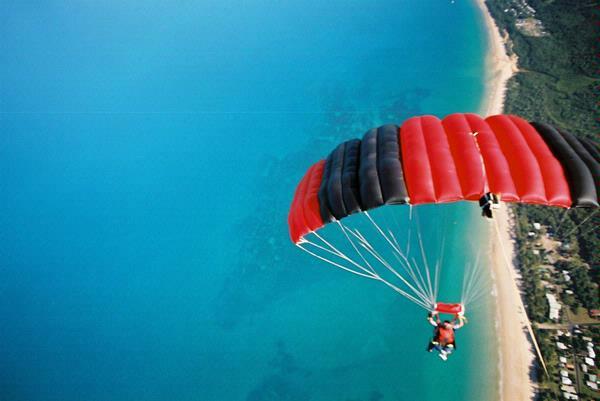 Skydiving right over Fraser Coast will offer you an amazing view as you slowly glide back to good old terra firma. When you think of Australia, generally the first thing that comes to mind (perhaps second to kangaroos), is Sydney. So why not see it for yourself; from the air. When skydiving in Australia, the closest landing you can get to actual Sydney City is over Penrith Lakes. The area is considered to be one of the most beautiful cities in the world, and with the Blue Mountains as its backdrop, you will not be disappointed. The jump height here depends on weather conditions, but is generally a fall of about 12-14,000 feet. After a heart-pounding free fall, your chute is deployed at 4,500 feet and you can enjoy the serene 5 minute descent back to the ground. Yet another one to add to the list of beautiful beach landings when skydiving in Australia, Wollongong is an experience to be remembered. Wollongong is located right near Sydney, and your 14,000 foot, 200 kilometer per hour fall will have you taking in incredible views of it. That is, if you remember to keep your eyes open. 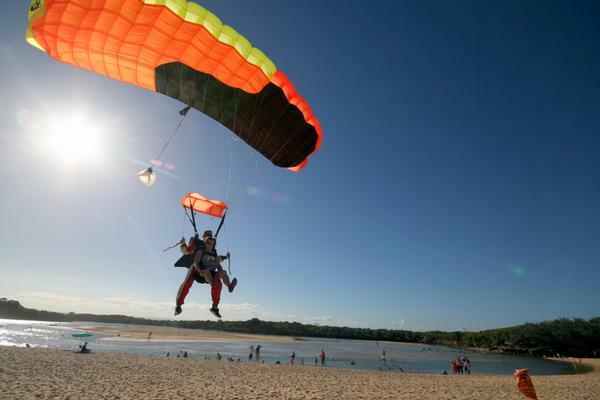 Wollongong is also the only skydive site that offers a beach landing right near Sydney. There are other dive sites, but they don’t offer the serenity and comfort of the sand between your toes as you finally reach the earth. The view from above Victoria is absolutely stunning, and those looking for a new extreme sports adventure might enjoy the view even more; without a plane. The Bells Beach skydive puts you right above Victoria and allows you the incredible scenery of the Great Ocean Road as a bonus. The 10,000 foot jump and five minute descent are sure to have you coming back for more. 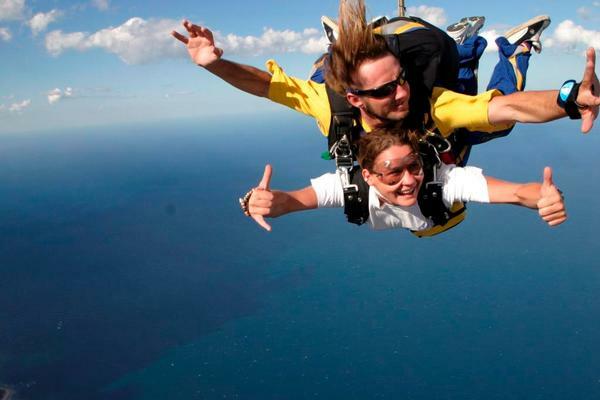 Byron Bay boasts the longest free fall that skydiving in Australia has to offer. If you are booking your Australian skydiving trip with the hopes of adding something amazing to your list of extreme sports accomplishments, this just might be it. Byron Bay is a serene location that offers a tranquil atmosphere unlike anything else. Of course, tranquility is the likely the last thing you will be feeling as you free fall over it and watch the beach get bigger and bigger as you get closer. If it’s scenery that you are searching for while skydiving in Australia, Brisbane is where you want to be. You can start the day off on the ground taking in Redcliffe, Moreton Bay, and the Glasshouse Mountains. As soon as you’ve gotten a good look, it’s time to look again; from the air. 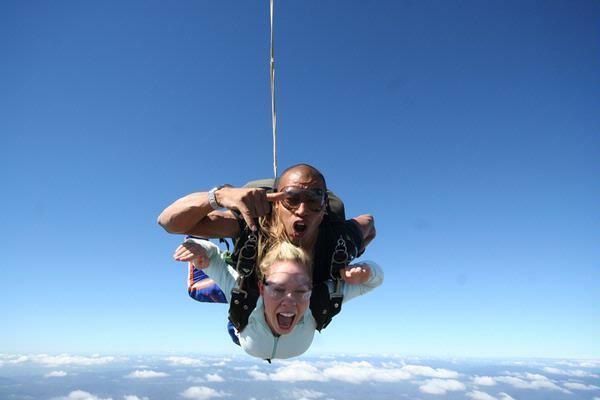 Another 14,000 foot jump, Brisbane will take your breath away in more ways than one. 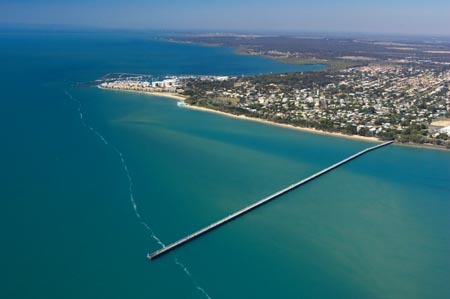 As you descend, you will have incredible aerial views of incredible beaches, Moreton Bay, the Moreton and Bribie Islands, and the Glasshouse Mountains. At Cairns, skydiving in Australia gets even more extreme. For now, your choices are to jump and glide over the beach or over the beautiful tropical gardens, but soon, Cairns will offer something so extreme, even the most seasoned extreme sports fanatic will be shaking in his chute. Cairns will soon offer you the opportunity to skydive right into a crocodile farm. It would be an understatement to say that you probably want to really watch your landing so you don’t end up somewhere you might soon regret! After your landing you will get a tour of the entire croc farm, the opportunity to watch a crocodile feeding, and even a photo op with Mr. Crocodile himself. Whether or not you decide to embark on a crocodile landing, Cairns has plenty to offer. A half-hour helicopter ride takes you to your jump site, and if you still need a little extreme sports fix after that, you can spend the rest of the day snorkeling in the Great Barrier Reef. 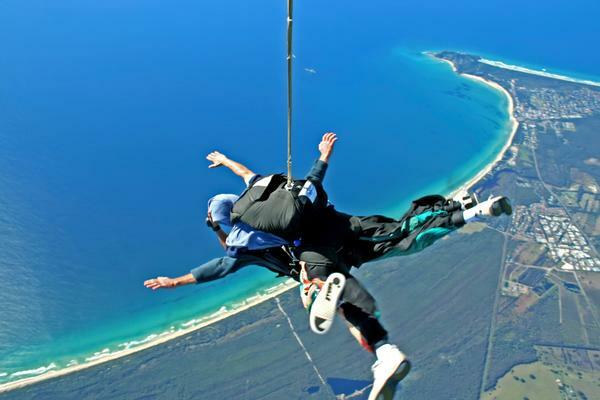 After a 25 minute flight that takes you to a gut-wrenching 14,000 feet, you will take the plunge and jump right over the beautiful Fraser Coast. Within just over a minute, you will have fallen 9,000 feet and your heart rate will likely have tripled. Once you deploy your parachute at 5,000 feet, you can relax and enjoy the quiet of a height unknown by most. Take in the Fraser Coast and Rainbow Beach; both even more exquisite from above. Your jump comes to an end as you land blissfully onto the sands of Rainbow Beach. The photographs in this article are courtesy of: Get Price, All You Need is Lists, Sydney Skydiving, Air Sport Experiences, and Gayle Gillet. This entry was posted in Air Sports, Australia, Featured, Sky Diving, Travel and tagged Australia, Skydiving, Top 10. Bookmark the permalink.